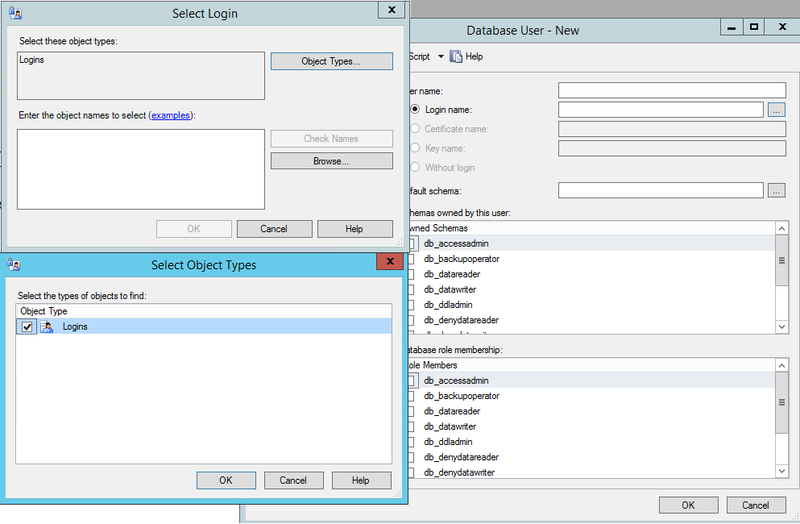 SQL Server 2008 R2 on Windows Server 2012 R2, none of the built in security principals are appearing when trying to view user accounts and assigning permissions. They are available on the service to assign the LOGON as value. Specifically I am looking for NETWORK SERVICE. FOR CLARIFICATION: I am referring to the local accounts IUSER, NETWORK SERVICE, LOCAL SYSTEM, etc. I just completed a parallel installation on a demo server with no issues both 2012 R2 boxes. The one with issue is a VM. And just to confirm, the accounts DO IN FACT exist on the server. So they were created during the OS install. I uninstalled an reinstalled both SQL Server and SSMS, both back up and running, same issue. Any ideas on how to get those back? Click the Object types and check build in accounts, system accounts etc and then search. As it turns out the accounts are on the system, but for some reason they do not appear in the listing when looking to add them to a database. Very unusual.